What Is Involved In A Cat Preventive Care Program? At Prestige Animal Hospital, we understand that prevention is truly the best medicine where the health and wellness of your cat is concerned. This is why we offer our feline patients and their human counterparts a comprehensive array of cat preventive care services that promote cat health,wellness and longevity of life. The focus of a preventive care program is to ensure that your cat is receiving everything they need to live a healthy life including proper nutrition, good hygiene and adequate stimulation, as well as early detection of any illness or disease that may be developing. In the fight against various feline diseases, early detection makes a significant difference in the scope and effectiveness of treatment. Most feline diseases are much easier to treat in the early stages, while some diseases can actually reach a point where treatment is no longer an option. And, unfortunately, cats are so good at hiding signs and symptoms of disease that by the time symptoms become obvious, it may be too late. This is why regular exams are critically important. Based on the findings, your veterinarian will discuss any concerns, make recommendations and work with you to keep your cat as healthy as possible. Of course, the temperament and disposition of your cat can affect your ability to maintain this regimen. If you are unable to do so, or if you have any concerns, our veterinary staff would be happy to discuss options and alternatives with you at your next appointment. Cancer is among the most frightening and painful diagnosis a cat owner can hear. It is also a disease that stands a better chance of being defeated if it is detected early on. As a cat owner, if you notice the development of lumps or conditions that look worrisome, please schedule a veterinary appointment immediately. However, it is important to understand that most of the cancer symptoms that a veterinarian will be able to spot early on, will not be noticeable to you. Again, because most signs of illness in cats remain subtle until they are in a more serious condition, it is very important to have a veterinarian give your cat a thorough physical on a regular basis. During the exam, our veterinarians will review with you what signs to look for in a cat which may be developing a serious illness. Integrative medicine can be very effective in promoting cat health when used in conjunction with other veterinarian recommended therapies or treatments. Ask your veterinarian what types of integrative medicine can help you have a happy and healthy cat for many years to come. A thorough cat teeth cleaning is something you should trust to your veterinarian every 12 months, but regular brushing can be performed in the comfort of your home. We would love to assist you in learning how to approach and brush your cat's teeth. Many cats will tolerate daily teeth brushing if done in a gentle and respectful manner. You can also help facilitate excellent cat health by providing toys and treats formulated to help strengthen and/or clean your cat's teeth and gums. For more information on feline dentistry, visit our cat dental care page. No insects are as troublesome to you and your cat has fleas and ticks. Fleas can cause severe skin irritation and can infest your home if you do not have a good preventive plan. While less common than fleas, ticks can transmit dangerous and even deadly diseases. Both indoor and outdoor cats are at risk for fleas and ticks, as these parasites can thrive in almost all geographic locations. This is why flea and tick prevention is a cornerstone of comprehensive preventive care for cats. It is important to be aware that there are numerous products on the market that our Veterinarians would strongly suggest you avoid. Every year, our veterinarians review all available flea and tick products to ensure that our recommendations are as up to date as possible. Our considerations include safety, effectiveness and cost. Based on these factors we will work with you to customize a parasite prevention plan for your pets and family. As part of the preventive care for your cat, we will help you choose the safest, most effective parasite products. For more information on flea and tick prevention for cats, visit our cat flea and tick page. Your veterinarian can help determine if you cat is following a healthy diet, and also help formulate one tailored to your cat's nutritional needs, lifestyle and current condition including prescribed feeding frequency and serving size. In general, we recommend high quality canned food as the primary source of nutrition. However, some kibble in the diet may be ok in small amounts. Most cats will overeat if allowed to free feed. Remember, your cat will not tell you if they are full, nor can they make positive nutritional changes themselves. Therefore, you must take control of their dietary program, in order to ensure their health and wellness throughout every stage of life. Vaccinations are a fundamentally essential component of cat care. They consist of a series of immunizations given to your cat as a kitten, and then boosters given periodically throughout its lifetime. Vaccinations help prevent and fight various serious, even potentially fatal diseases that cats are at risk of contracting. 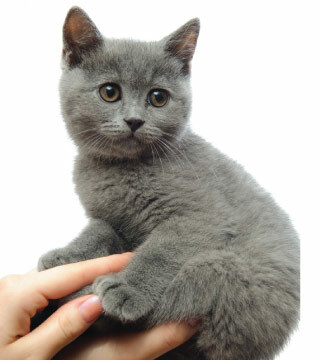 They also help prevent the spread of diseases between felines, as well as to human beings. Although the rabies vaccine is the only vaccination currently required by law in most states, we strongly recommend fostering good cat health by making sure your feline friend completes his or her recommended vaccination protocol on time. This program is determined with your veterinarian, and is based on the lifestyle, geographic location and pre-existing medical conditions of your cat. We are a dedicated, knowledgeable and passionate group of veterinarians who absolutely love both our kitty patients, and their human counterparts. We are here to provide comprehensive and compassionate preventive cat care services, and to help you learn how to provide the best care in every way. Contact us to discuss a preventive cat care regimen for your feline friend, and to schedule an appointment with one of our veterinarians today!